A chance for stage folks to say hello! Another op'nin of another show. Last night it was the stage at Kellogg High School. Tonight, it was a stage about 15 miles down the road, in Wallace, at the Sixth Street Theater. Tonight was the opening of "Country Through The Years...Hee Haw Style", taking the corniness and country humor of the old Hee Haw show, and mixing it with some country music. But this time, I'm not an actor, or a writer, or a singer. I am the lighting technician. I light up the stage. I blackout the stage. And because of the type of show this is, I have a lot of lighting cues. And it is really fun!! I love the theater, and I want to learn all different aspects of it. Some day I will probably take the opportunity to direct a play, so this helps me gain more understanding of the total process of what it takes to put on a production. The audience really enjoyed tonight's performance. The cast received a standing ovation. They did a good job. 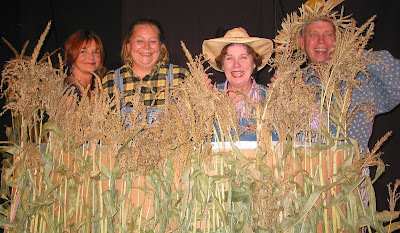 If you are interested in some fun entertainment, come and check out "Country Through The Years...Hee Haw Style". The show will run this weekend, and the following two weekends. Go to http://www.sixthstreetmelodrama.com/ for more information about show dates. It is great to see you are learning so many sides of the theater. How fun!